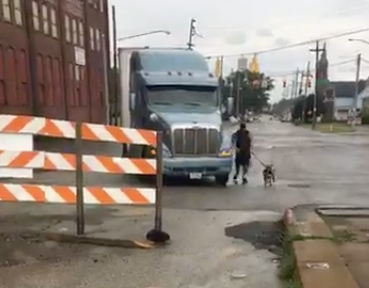 VDV#19 Trucker from Las Vegas walks his dog on the #ErieViaduct — Why Save the Viaduct? To Keep Kids Safe. This afternoon around 4pm, a trucker from Las Vegas, walked his 5-month-old dog, Rye, on the #ErieViaduct as he waited to unload on Friday, June 22, 2018.